Glastron has equipped the GS 289 with a most complete list of standard equipment for a cruiser this size and the available option list is relatively short and indeed includes those items which would be considered “optionable” and worthy of making a choice to include – or not, depending upon the nature of your boating pleasure. Let’s explore. The very generous sized integrated molded swim platform with recessed, covered, telescoping stainless steel boarding ladder and stainless grabrails will probably suit most buyers, but a one step down and closer to the water very large extended platform may be optionally added. A transom shower is standard. Trunk storage is contained within the transom and a portside walk-thru with safety closing door leads to the self-draining fibreglass cockpit. 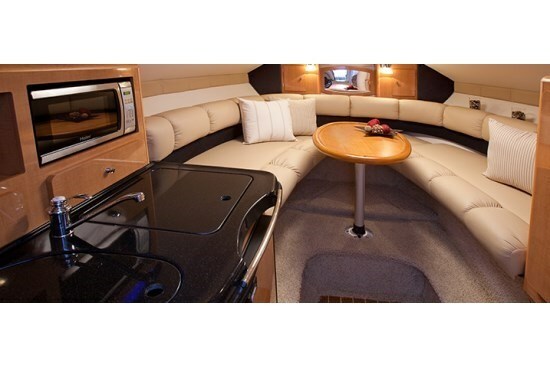 There is lots of seating flexibility with a comfortable two or three seater lounge opposite the double-wide helm seat with flip-up forward bolster. A removable double-wide starboard side transom seat faces a rear-facing seat behind the helm. Between these two seats you can optionally add a removable cockpit table which converts these two seats into a sunlounge/sleeper with a removable table cushion. Perhaps unusual for a boat this size, teak-style cockpit snap-in carpet is standard as is a refreshment centre complete with wet bar w/sink, refrigerator, and water system. Beverage holders are stainless steel. Behind the tilting “custom non-directional woodgrain steering wheel,” the tan coloured dash (for non-glare) provides a large central area for your personalized electronics screen. Included are Faria fog-resistant gauges with polished raised bezels. Standard equipment includes a stainless steel starboard windshield wiper, hydraulic trim tabs, remote control spotlight, compass, depth sounder, and hour meter. The only options are factory electronics including a GPS chartplotter, radar, and a VHF radio. 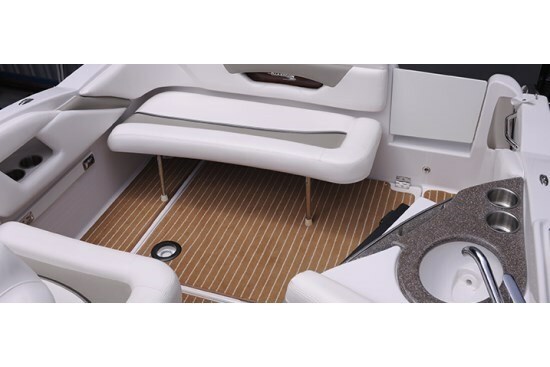 The centrally located sliding acrylic cabin entry door has built-in steps for access up and through the centre windshield walk-thru to the foredeck. Going below into the cabin you will find a very complete galley to port and enclosed head to starboard. 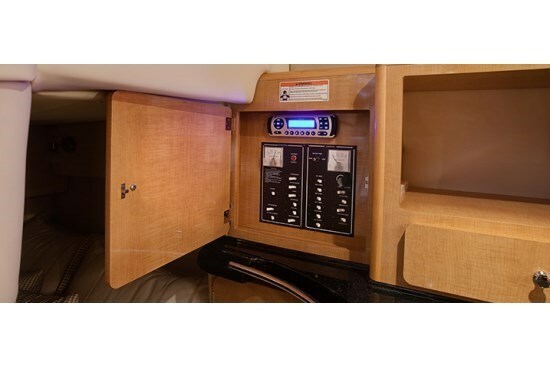 Standard inclusions with the galley are a microwave oven, 12/110V refrigerator, coffee maker, electric stove, 110V dockside power, sink and water system including hot water plus of course storage cabinets. The fiberglass lined head compartment includes stand-up shower, sink, cabinet storage, and a standard electric toilet. The forward convertible dinette/V-berth offers a U-shaped dining area around a removable/convertible wood table, soft, tufted upholstery with bolster backrest, lots of storage, a hanging locker, forward mirror, plus an overhead circular, screened hatch. The only options to consider here include reverse cycle air conditioning/heating, pillow and towel décor package, and a flatscreen TV/DVD player which would replace the forward mirror. The standard entertainment system is a Sony® AM/FM/CD stereo with MP3 port plus a stereo remote and a MP3 remote port at the dash. 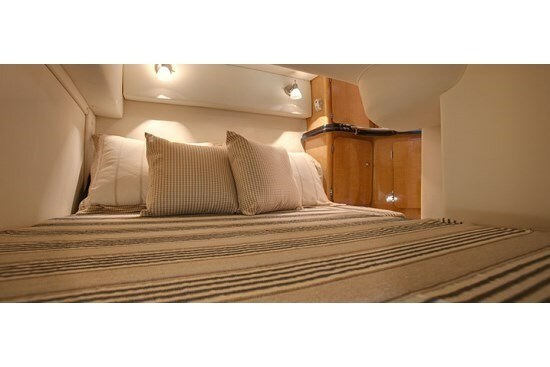 The mid-cabin berth offers overhead lighting, storage and a privacy curtain. Three opening, screened portlights are provided in the cabin plus another one in the head. Single sterndrive power for the GS 289 includes choices from both Volvo Penta® and MerCruiser® from 300 to 380 horsepower. A colour-coordinated bimini top with boot is standard equipment. Options include full camper enclosure, aft curtain with enclosure, or simply a cockpit cover. About the only other options include a generator, anchor windlass, foredeck sunpad cushions, and a forward-facing arch.